This quote landed on my Facebook page the other day, and it made me stop and ponder how much time we spend focused on what to think, with very little time spent on how to think. We ask each other “what do you think?” all the time, about subjects from dinner to religion to politics. Yet we rarely explore with one another the topic of how we think. 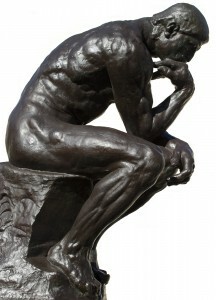 I don’t remember anyone teaching me how to think, though I’m sure it was embedded in my education, at some level. But Dr. Tyson’s quote suggests that we should make the how of thinking more explicit, and I couldn’t agree more. I was fortunate, a couple of years back, to stumble upon the work of David Rock. He came to my attention when a friend mentioned a book called Your Brain at Work. The title intrigued me, so I investigated, read the book, and changed forever how I think about how I think. I next read Brain Based Coaching and knew that the coaching certification offered by David’s company was the one for me. I loved the idea that the emerging findings in brain science could help us figure out how to solve problems! I loved the intersection of neuroscience and behavior! In the Spring of 2011, I began my training in neuroscience-based coaching, and I learned a great deal about how we think. My job as a coach is to focus on my coachee’s thinking, as they puzzle through a problem, challenge, or dilemma. I get to see and participate in the thought processes that occur as we’re working things through, and that is a tremendous privilege, and a daily learning experience. It’s exciting to be there, at the moment of insight, when my client says “Ah, I see!” or “I know exactly what I need to do next!” The energy shifts, not just in the individual, but in the whole room! I describe my coaching work as “thinking about how to think.” I love what that brings to my world, and I love what it allows me to help my clients accomplish. Last fall, I completed the coursework required to become a Results Certified Coach through David’s company, and then went on to complete the Professional Certified Coach (PCC) credential through the International Coach Federation. If you’re not familiar with coaching training and certification, there are basically two processes. First, you must complete 125 hours of coach specific training. That gives you a basic coaching certificate, which many individuals and organizations value. If you want to take your certification to the next level, you begin the ICF process, in which you submit proof of those 125 hours of training, proof of your client coaching experience (for the PCC that’s 750 hours of documented work with real, live coaching clients) and then complete three live assessments of your skills by other certified coaches. There are some variations to this process, but the bottom line is it’s a rigorous educational process followed by a requirement to prove your ability to demonstrate the 11 ICF Core Competencies, as assessed by your peers. All that, and documentation of coaching hours, means that I am well prepared and qualified to coach individuals and teams on a variety of issues and challenges. The process was enlightening, sometimes entertaining, and always challenging, but I have come to value the ICF certification highly (and not just because I passed it!). I value it most because I’ve been an Organization Development consultant for almost 11 years now, and one of the challenges I’ve faced is that there are no barriers to entry in that profession. It means that sometimes I’m working with organizations that have had less-than-qualified consultants guiding them, and I have to undo some learning before I can be effective. Coaching is the same – no real barriers to entry. If you know how to talk to people, you can call yourself a coach, or a consultant, and if you can get yourself hired, you can make a decent living at it. But I always recall what a graduate school professor said to us during one particularly interesting case study. She said “Never forget, you’re dealing with people’s psyches, and that’s a huge responsibility!” That statement has echoed in my brain for over a decade now, and it’s the primary reason that I value the ICF certification. It’s not a perfect process. There are loopholes, surely, and I’m sure some people find them. But at this stage of the coaching profession, it’s what we have, and it’s a valiant attempt to protect the psyches of those with whom we are fortunate enough to work. So consider, please, how you’re thinking, the next time you’re trying to solve a problem, face a challenge, or puzzle through a dilemma. What’s popping into your mind? What standard scripts are playing in your head? What thoughts are you discarding, out of hand? When you start to shift from a focus on what you’re thinking to how you’re thinking, you’ll be, as Dr. Tyson says, empowered!